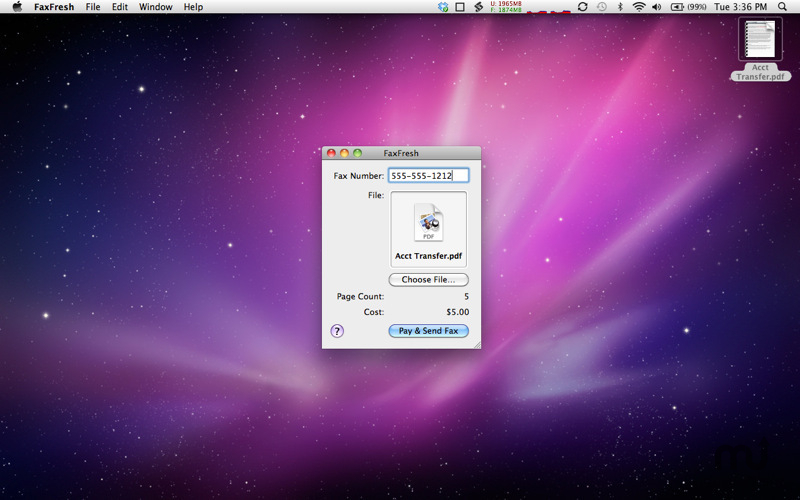 Send faxes from your Mac. More Apps Purple Cover, Inc.
Is there a better alternative to FaxFresh? Is FaxFresh really the best app in Applications category? Will FaxFresh work good on macOS 10.13.4? The FaxFresh app allows you to send a fax from any Mac with an Internet connection to any U.S. or Canada telephone number quickly and easily, using the FaxFresh cloud service. Just select the file to send, enter the destination telephone number, and pay a small fee and your fax is on its way. We'll send you an email confirmation so that you can be confident that your fax was received. If your fax is not sent successfully for any reason (e.g., wrong telephone number) then you will not be charged. Updated help to explain how to merge multiple PDFs. Updated help to explain how to add your signature to a document. FaxFresh needs a rating. Be the first to rate this app and get the discussion started!